Mother’s Day is a special day to show our mums how much we really care about and appreciate them. 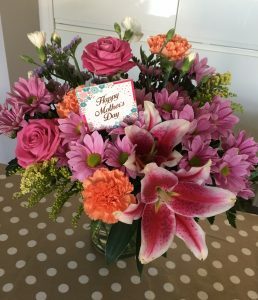 Although it’s not about how many flowers or gifts you give or receive, it’s always a nice feeling to be able to show our mums how much they mean to us by doing something nice for them or with a small gesture to make them feel loved and special. Mother’s Day was really lovely this year and I was very spoilt by our children. I also managed to spoil my Mum and Mother-in-law by cooking them dinner. I cooked a slow-roasted beef brisket with potatoes and onions which I must say was very moreish and and definitely worth the time and effort. The recipe I used was amazing and can be found here. It’s also a very busy time for our client’s that supply flowers for such lovely occasions and what a brilliant job they did. My flowers were amazing 😊 Thank you.